Jewelry kiosk business in mall is always the best and profitable business ideas. No matter in advanced western countries or developing countries. People never stop the steps of pursuing high-level luxuries. To success in a jewelry retail business, the displays play an important role. If you want to have more customer in your jewelry retail shop. you should spend more time at the very beginning. For example, From a single jewelry display showcase design. 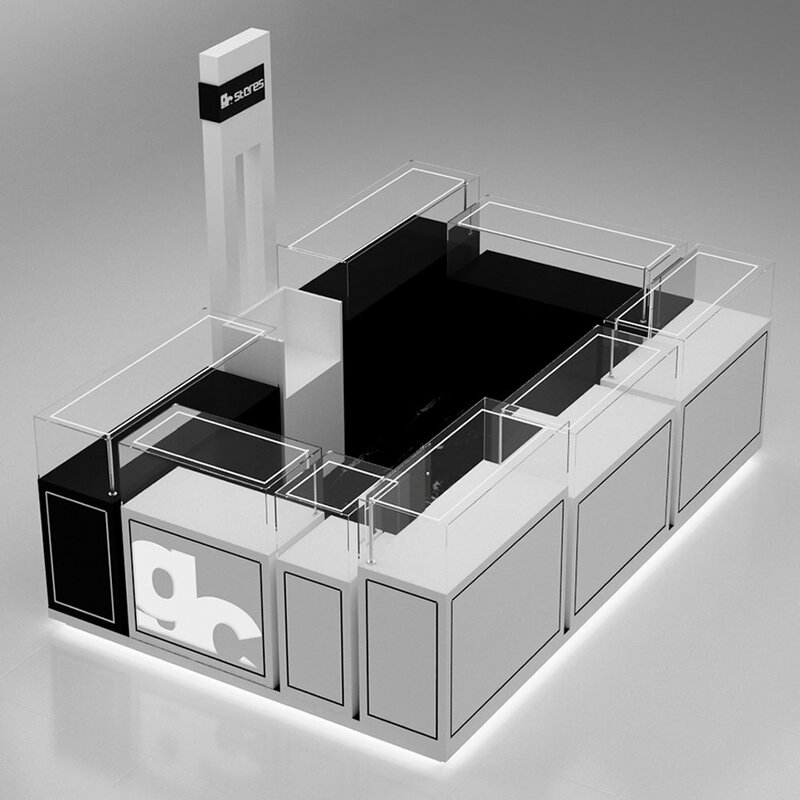 Here below is a very nice Custom black & white GC stores jewelry kiosk design concept. Best suit for square locations in mall. 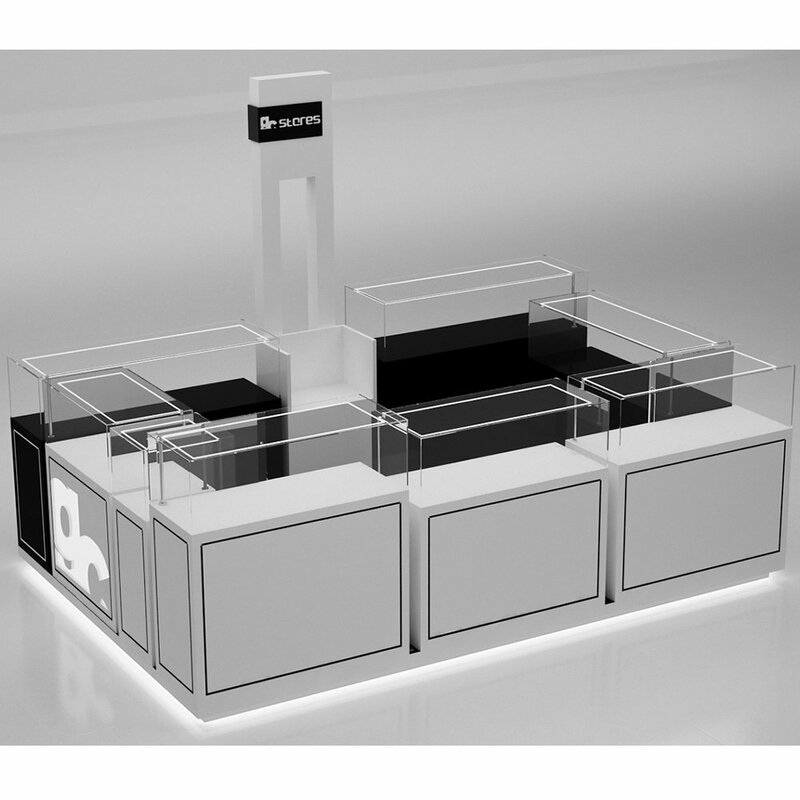 The whole concept of this jewelry kiosk is combined with white and black color, On one part of the kiosk are fully white for silvery products display. On the contrary, the right part where finished with black color will be suitable for gestures, diamonds, and gold. On the white display cabinets, we use black stripes to give a clear comparison. While on the other sides, we use white stripes to decorate it. This make the whole kiosk are differnt but united one themes. Kiosk conceptes like this are perfect for those have has different prodcuts to display. 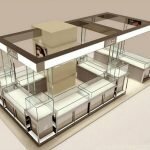 Unique Kiosk is a leading jewelry kiosk manufacturer, we have been a custom design and build jewelry display stands, jewelry display showcase for over decades. If you are looking for a unique kiosk design with affordable cost. Here will be the best place to go to. Our jewelry display retail kiosk has been delivery to many cities all over the world. Here is some core feature of our displays. We offer free jewelry kiosk design, include 3D rendering and 2D construction drawing. Best price that you can never find on the internet. So, When you planning to open a jewelry retail store in mall ? or looking for jewelry shop-in-shop display, Visit and browse our sites first, I m sure you will find your ideal display. 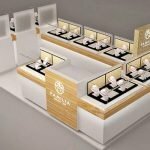 If you are looking for custom projects with Unique ideas, just contact us and our experienced team will help you achieve an awesome jewelry kiosk projects.